Thanksgiving is over and I'm officially in Christmas mode! I've secretly been in Christmas mode since shortly after Halloween, but I don't let my freak flag fly til Thanksgiving. I love decorating. I have a myriad of decorations which I mix and match, creating a unique design every year. When it comes to Christmas ornaments, I can get very sentimental. I have ornaments from my grandparents that have been on a tree every Christmas since my mother was a little girl. I have treasured hand made ornaments, collectibles, mementos made by my children, and ones made by me when I was a child. It's a beautiful and well loved collection. Some of my most fond memories of Christmases at my grandparents' house with my cousins are of us kids crafting ornaments together. I still love making ornaments! Recently I've been seeing crocheted ornaments on social media, and it inspired me to design my own! I asked my family what ornament they would like to see. My daughter suggested a tree, but everyone makes trees. I said I wanted to make something original and cute. 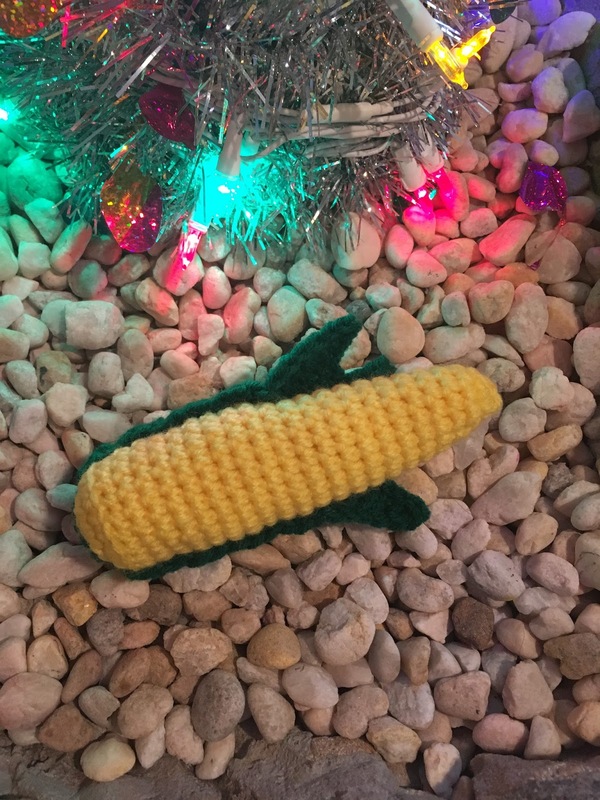 My genius husband then chimed in, "Hey make a corn cob!". We laughed, and then I began to think. The corn cob is by no means "Christmassy" but it's adorable, comical, yummy and delightfully unexpected! Intrigued, I decided to go for it. I'm no amigurumi expert, but I have made a few things. The basics are simple. Amigurumi are worked in the round, rounds are not joined (stitch markers are a must). Items are stuffed with your basic poly-fill, sewn shut and voila- you have an adorable crocheted plush toy! Now, keep in mind, I'M LEFT HANDED! Shocker. I know. My cousin who is my right handed pattern tester has just come to a startling conclusion. Some of the things she makes from my patterns come out backwards, or inside out! I noticed over the years, that some things I make from other people's right-handed patterns come out backwards or inside out! Amigurumi included. She and I put two and two together and figured it out. I'M LEFT HANDED. There's nothing we can do about this. 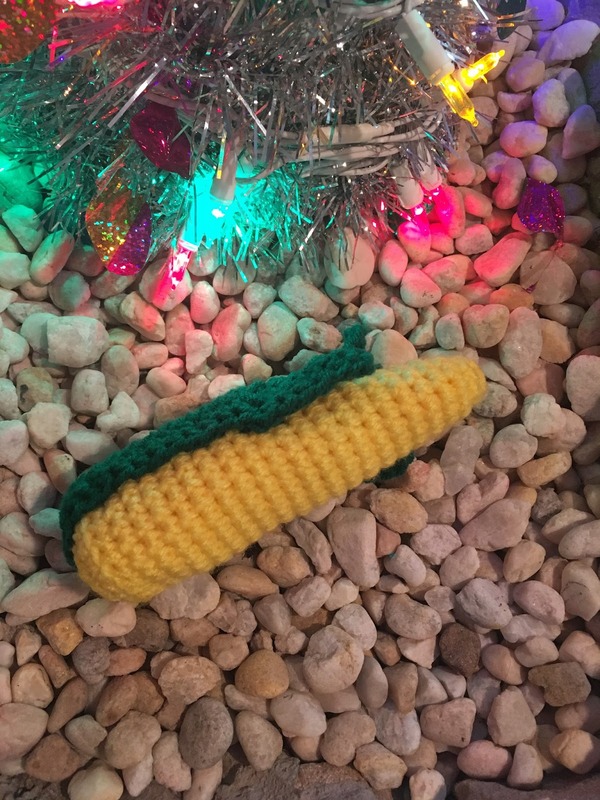 Pity party aside- I mean upside down (left handed crocheting joke, insert laughter here) this corn on the cob is really fun, and really easy to make. It works up quickly and makes an adorable festive addition to your family tree. 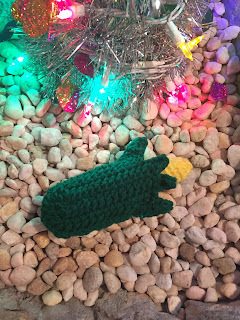 It's the cutest conversation starter your holiday party ever had! 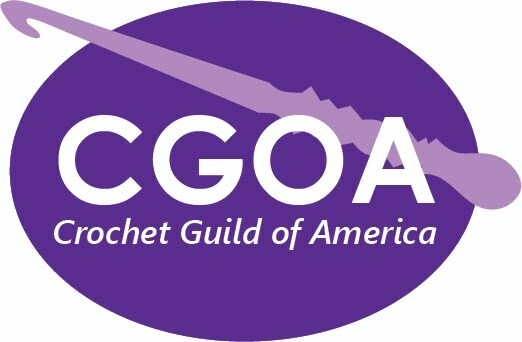 Notes: On cob, be sure to mark the first stitch of each round, as you will not be joining rounds, but continuing the work by making the first stitch of the next round on the first stitch of the last round. This will eliminate an unsightly seam on the toy. On husk you will be working into both sides of the beginning chain forming a u shape. Spikes on the husk are formed similar to picots, or points on a star. Once the spike is made, it is sl st into place where indicated. Work continues around outside of husk in rows. Rnd 1: sc 10 into the ring. 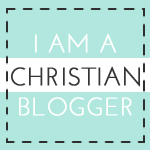 Join with a sl st. Break yarn leaving long tail and sew small hole closed. Weave in ends. Row 1: dc in third ch from hook, dc in each of the next 10 chs, make 7 dc in last ch, pivot work, (continue by working back up the other side of the chain, into the "v"s) dc in each of the 11 remaining chs, do not turn, ch 4, sc in second ch from hook, hdc in the next ch, dc in the last ch, sl st to top of beg ch, ch 4, sc in the second ch from hook, hdc in the next ch, dc in the last ch, sl st to top of first dc. Do not turn, keep right side facing. Row 2: Ch 2 (does not count as first dc), dc in first st, dc in each of the next 13 sts, make 2 dc in next st, 2 dc in the next, 2 dc in the next st, dc in each of the next 13 sts, do not turn. Row 3: ch 4, sc in second ch from hook, hdc, in the next ch, dc in the last ch, turn, dc in each of the next 13 sts, dc 2 in the next st, dc 2 in the next st, dc in each of the next 3 sts, dc 2 in the next st, dc 2 in the next st, dc in each of the next 12 sts, do not turn, ch 4, sc in second ch from hook, hdc in the next ch, dc in the last ch, sl st to turning chain of previous row, FO weave in ends. 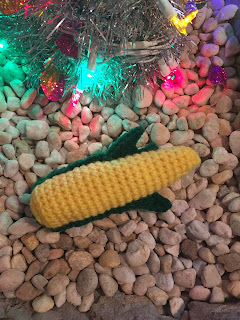 Nestle corn cob inside husk and using green, sew husk to cob. Add loop to hang if using as an ornament. 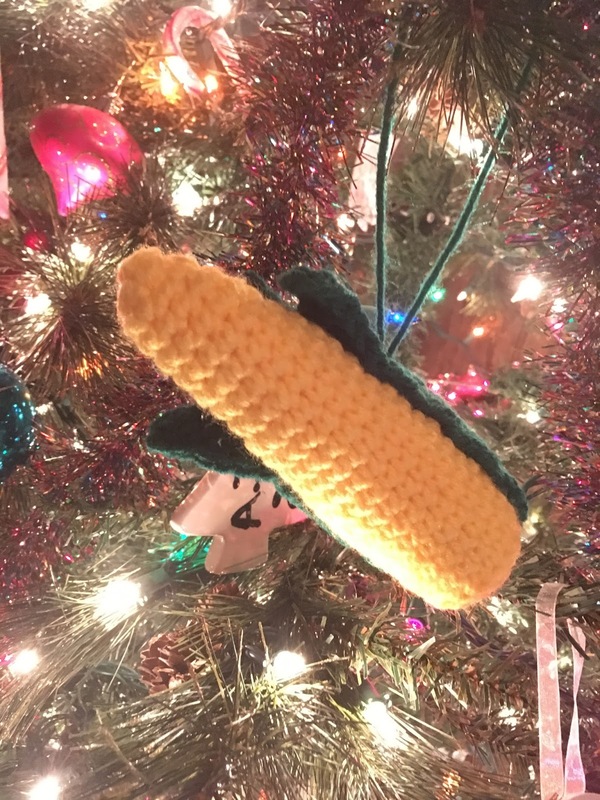 Have fun giggling and enjoying your corn cob, and watching other people's expression as they notice it hanging from the tree!